The Kappa 5 Dual Servo, a variation of the Kappa 5, features dual servo drive and offers improved operability and cost-performance without altering its compactness. Dual Servo Drive ensures high repeat accuracy. 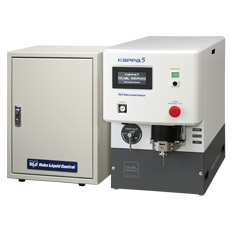 Use in combination with the touch panel employed in the original Kappa 5 offers digitalized discharge operation. 2-axis compensation control allows for easy setting of ratio, discharge amount and speed. The layout inside the unit is simplified, resulting in improved maintenance performance. The high-speed small brushless motor newly employed for the mixer is quiet, which helps to improve the work environment. *1 The values given above are theoretical and may change depending on the type of liquid handled and conditions. *2 Depending on the conditions of use.